Tesco Plc, one of the largest food and beverages retailers in the world is a non-cyclical company that has seen enormous investment from around the globe including Warren Buffet’s parent firm Berkshire Hathaway. On grounds of the company’s established strategy and mature business model it is a recommended investment for the client. The fundamental pillar as to how corporations are run day to day and all stakeholder interests (shareholders, management, suppliers etc) are taken into consideration is referred to as “Corporate Governance”. The term encompasses the framework for internal controls that a company has in place to help management and those in charge of running the company to act in the best interests of the shareholders (CFA Institute, 2013). Consistent high quality financial reporting so as to ensure investors are receiving all relevant information in a timely and verifiable manner that eventually results in maximum profitable allocation of resources and capital. Tesco’s operations around the globe have allowed it to develop a strong and fair framework for running the company across all the markets it operates in. The Board of Directors incorporating the Chairman, the Chief-Executive alongside Non-Executive Directors who provide independent appraisal of the vision of the company whilst adding insight to the strategy lies at the forefront of governance (Tesco, 2014). Furthermore, a senior Independent Director is also present on the Board to ensure all conflicts amongst management and shareholders are resolved in the interests of the shareholders which eventually prevents any “agency problems” or front running by the management in regard to the shareholder investments. The specialised tasks of running the company have called for segregations of major duties to respective committees in the corporation. At present Tesco Plc supports its vision with the help of five committees (Tesco, 2014). The major drivers of each committee alongside its evolvement over the years are summarised below. The Audit Committee: The committee is tasked to ensure that the risk management principles for the company are effective and are consistently updated to keep risk management of Tesco in line with its strategy (Tesco, 2014). Furthermore, interim audits and financial disclosures are verifiable and accurately presented to any person who demands knowledge of them. The Audit committee is also responsible for recommending the appointment of an independent external auditor for the yearly audit and conducting inquiries into management in regard to any investigative matter it deems fit (Tesco, 2014). Over the years the committee has hired external legal counsel to advice on matters that have raised concern. The Remuneration Committee: The Remunerations committee is primarily responsible for determining the compensation agreements of senior management as well as analyse structure of compensations that needs to be extended out to Executive members so as to retain the most competent and diligent executive management for overseeing the company (Tesco, 2014). The committee sets out the incentive fee specifications for senior management as well as deliberates on the aptness of expenses that can be claimed by management so as to focus on long term profitability and not short term goals (Tesco, 2014). The Corporate Responsibility Committee: The committee was established in 2012 and incorporates the principles of the Companies Act 2006 to help govern its scope of operation (Tesco, 2014). The committee ensures Tesco acts in a sustainable manner to benefit the communities and environment. Moreover, it considers impact of corporate actions by Tesco or any of its subsidiaries on the ethical culture present across all its markets of operation. The Nominations Committee: The Nominations committee lies at the heart of the company. It is tasked primarily with all matters relevant to management. Acting in accordance with the Companies Act 2006, the committee ensures that executives on the board possess relevant skill to discharge duties, project a vision for the achievement of goals and the balance required between executive and the non-executive directors so as to maintain independence within the organisation (Tesco, 2014). Furthermore, the committee deals with regular appraisal of management so as to make sure the leadership quality of the board is not compromised. Since its development the committee has also taken up the responsibility to ensure that equitable nomination procedures are drawn and implemented on a firm wide basis as well as a smooth transition mechanism is prevalent for passing over of responsibility when managerial personnel change. The Disclosures Committee: The committee not only makes sure that consistency prevails in financial statements making them easily verifiable but also scrutinizes the annual reports to ensure that accounting estimates or policies are not inappropriate for treatment of various matters (including financial and operating leases) (Tesco, 2014). The committee also deals with incorporating a framework within the firm to handle “material nonpublic information” and how it is to be disclosed. Given the nature of the work of such committees the overall oversight responsibility lies with the Chief Executive of the company. These add value by ensuring the laying down of a strategy for fulfillment of objectives. A brief critical outline for other minor stakeholders is also provided below. However, corporate governance should be more closely linked with management, the Board and shareholders. (CFA Institute, 2013). Tesco’s “Clubcard” rewards programmes and the “Finest Product” range helps the mature company retain its trusted image. Customers see such aspects as the most value efficient means for satisfying their needs. A store format from hypermarkets to corner stores ensures that each store type caters to the unique needs of the community it is housed in. Tesco’s ability to house a multichannel leadership under one roof helps keep barriers to new entrants high and protect market share in the UK. Tesco places immense importance on the skill and betterment of its employees. The company trained more than 250,000 employees last year in light of turning around the company. The employees are not only encouraged to suggest improvements in stores or company policies through Tesco’s feedback approach but are also made to feel as an intangible asset of the company by continuous investment in their betterment. Legislation has a huge impact on how Tesco conducts its businesses around the globe. The impact is further magnified when the company’s policies are in the spotlight. Anti-competitive and employment legislation have affected Tesco the most over the years, whether in developing or developed markets (Tesco, 2014). For a better public image and to comply with local legislation Tesco actively hires from the local community where new stores are opened. Furthermore, Tesco actively participates in sustainability projects where its huge hypermarket stores open up so as to benefit the community. Tesco’s significant market share allows it to obtain favorable terms from its suppliers from a monetary point of view whereas special teams such as the agricultural team within the corporation help make sure that the company obtains products of utmost quality from its suppliers (Tesco, 2014). Moreover, the “protector line” initiative by Tesco under which any wrongdoing on part of the supplier can be raised by the suppliers’ employees on behalf of Tesco would enable Tesco to improve its operations (Tesco, 2014). 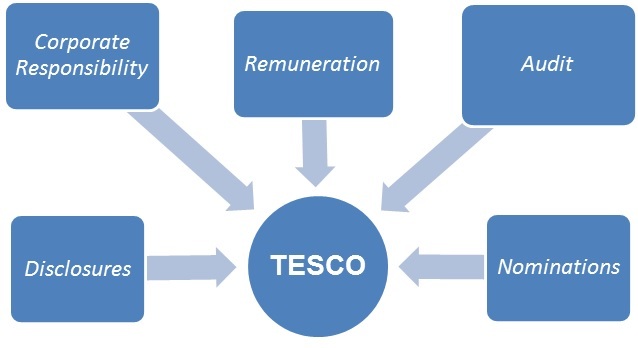 Having analysed the broad corporate governance framework prevalent at Tesco, improvements that can be instituted to reflect better corporate publicity and reputation are related to three main aspects of the company. The table below illustrates methods for strengthening the prevalent model. The complex and ever-changing nature of Corporate Governance does not allow for a limited set of principles that govern the matters. The interpretation of the framework for the corporate governance lies with the collaborate interaction of the shareholders and the management. Given Tesco’s strong framework to delegate matters of public interest and scrutiny to committees independent of the Board and delegating internal strategy vision to segments within the corporation, Tesco successfully ensures that all stakeholder interests are looked after at all times. The continuous updating of the foundations that form the Corporate Governance framework allows the company to retain its strong customer base and investor confidence. The internal review and revamping of the company’s strategic committees after the “Horse-meat scandal” ensure that the company strives to deliver the very best of responsibility at all levels. Given the responsibilities of various committees of the Board and a “Corporate Code of Ethics” within the firm it is safe to conclude that the company has established an effective corporate governance framework. CFA Institute (2013). Corporate Finance & Portfolio Management. USA: Wiley. Gray, I. & Manson, S. (2011). The Audit Process. 5th ed. USA: South Western – Cengage Learning.